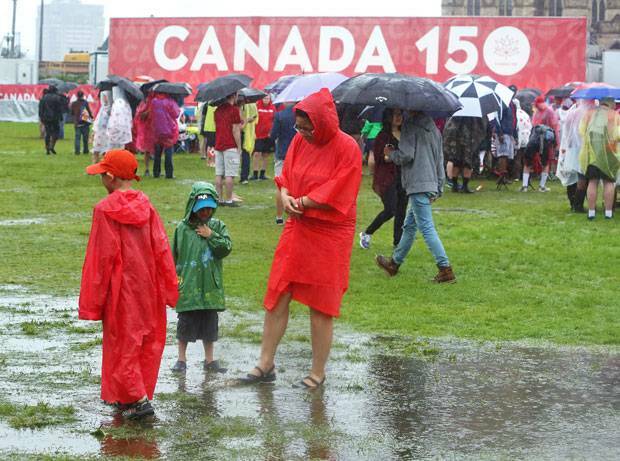 July 1, 2017: People take shelter from the rain on Parliament Hill in Ottawa during Canada 150 celebrations. Charlotte Gray is a historian and author of The Promise of Canada: 150 Years – People and Ideas That Shaped Our Country. Canada's sesquicentennial has revealed a lot about this country. For some Canadians, it has been a year of celebration – I've never seen so many "I (heart) Canada" T-shirts. But for others, it was a bust. And it highlighted some uncomfortable questions. We should have expected these contradictory responses. Canada 150 commemorated an event – the passage of the British North America Act, which established Confederation in 1867 – that for vast numbers of Canadians was either irrelevant or, more seriously, damaging. The attempt to have a coast-to-coast carnival was doomed from the start. 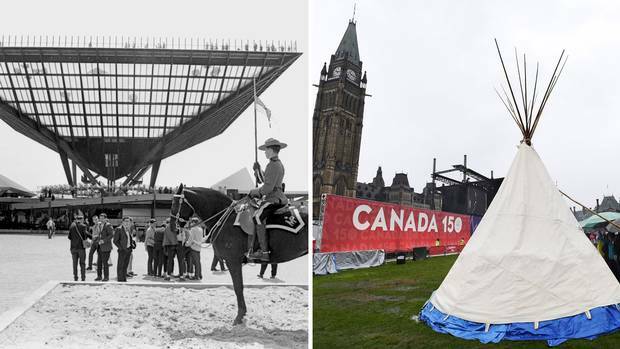 The sesquicentennial could never equal Canada's centennial, which included the heart-pounding excitement of Expo 67, recalled with misty-eyed nostalgia by older Canadians. Those festivities took place in a country with a population of little more than 20 million, where Indigenous people were largely ignored and in which most citizens were of British or French origin, spoke one of the two official languages and were predominantly churchgoers. Most English-speaking Canadians were blithely unaware of the gathering momentum of the Quebec sovereignty movement. General de Gaulle's "Vive le Quebec libre!" speech from the Montreal City Hall balcony in July that year came as a profound shock. Most significantly, in 1967 there was little sense of an authentic Canadian identity. In the words of historian Chad Gaffield of the University of Ottawa, the centennial celebrations were "all about boosterism, and weren't based on much evidence of Canada itself." Those were the years, argues Prof. Gaffield, president of the Royal Society of Canada, when "everything was imported – ideas, university teachers, culture." Canadians went elsewhere for postgraduate studies, and Canadian university faculties were populated by Americans who had fled the Vietnam War. CanLit was still in its infancy. So the 100th anniversary of the British North America Act was marked with ingenuous relief that the country had survived, and pride in the few national symbols that had emerged – the Mounties, the Maple Leaf flag and, of course, maple syrup. 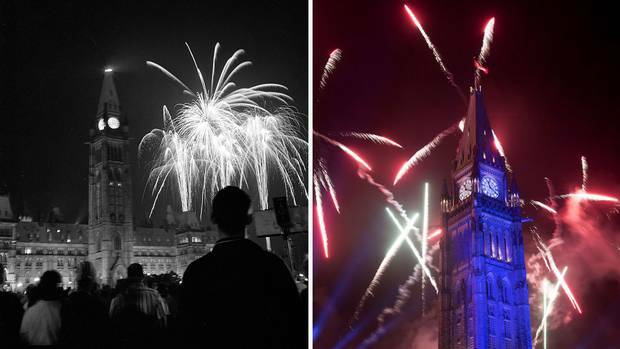 Fireworks ignite over Parliament Hill in 1967, left, and 2017, right. 1967: Queen Elizabeth II inspects the Ceremonial Guard on Parliament Hill. 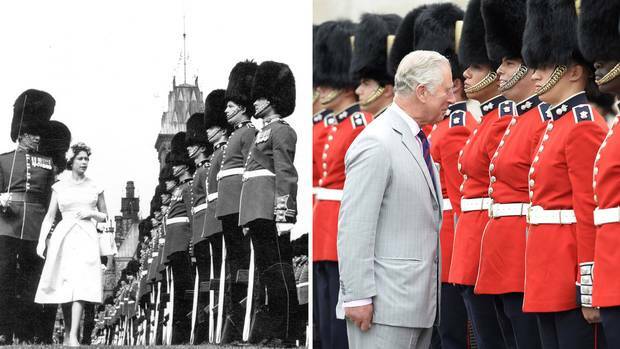 2017: The Queen’s son and heir, Prince Charles, inspects the Ceremonial Guard in Ottawa. 1967: French president Charles de Gaulle delivers his ‘vive le Québec libre’ speech from a balcony at Montreal’s city hall. Read here for Robert Everett-Green’s take on the anniversary of the incendiary speech. 2017: Prime Minister Justin Trudeau speaks at Canada Day festivities in Ottawa. In his speech, he acknowledged that Canada’s past was ‘far from perfect,’ and that Canadians must act to reconcile with Indigenous people. 1967: At Expo 67’s Canadian pavillion, the 66-foot-tall ‘People Tree’ displays colourful nylon panels showing pictures of Canadian life. 2017: Torontonians take a look at a giant inflatable duck, a controversial part of the Canada 150 festivities thanks to its $200,000 price tag. 1967: At Expo 67’s Canadian pavilion, a Mountie stands guard at a nine-storey-tall inverted pyramid dubbed Katimavik, which means ‘gathering place’ in Inuktitut. 2017: A tepee erected by Indigenous demonstrators keeps watch over Canada 150 celebrations on Parliament Hill. Mr. Trudeau met with the demonstrators, who described the act as a re-occupation: ‘We need our land back and that is what we are here to reclaim,’ protester Candace Day Neveau said. Fast-forward 50 years to a country of more than 36 million people of diverse origins, languages and faiths. A country built on compromise, still juggling events, possibilities and protests released during a half-century of evolving national self-consciousness. A country that has undergone warp-speed growth, but is still riven by intense regional pressures and gaping inequalities. A country in which deeper self-knowledge has laid bare not just great accomplishments (military victories, social programs, legal safeguards, artistic achievements) but also patterns of racism and discrimination, and episodes of appalling cruelty. No wonder that so much of the official sesquicentennial story was contested. For some groups, other anniversaries took precedence. 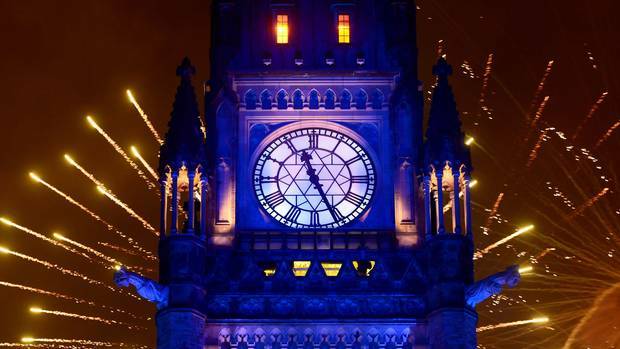 Montreal preferred to commemorate the 375th anniversary of the city's founding. Both Quebec and New Brunswick challenged the traditional narrative that Charlottetown was the cradle of Confederation, because the idea of a Maritime Union (the starting point for the larger political deal) came from New Brunswick's lieutenant-governor, and the terms of the Confederation deal were hammered out in Quebec City. And many newly arrived Canadians, unaware that there was once another prime minister called Trudeau, just shrugged. Why should they care about what happened more than a century ago? But the most substantial and stinging protests came from Indigenous peoples, for whom Canada 150 represented a celebration not of nationhood but of colonization. The birth of Confederation was simply one more date on which their existence had been ignored and their rights trampled. Thousands of messages of protest and discontent were tweeted with hashtags such as #Resistance150 and #UNsettleCanada150. Three days before the big Canada Day birthday bash, the Bawaating Water Protectors from Sault Ste. Marie arrived on Parliament Hill, erected a tepee and engaged in four days of ceremonies they called a "reoccupation," to draw attention to the history of Indigenous people. In 2017, Indigenous protests find a sympathetic audience within the non-Indigenous population. The City of Vancouver put its money into an event tagged Canada 150+ that focused on the province's Indigenous history and culture. (Initially, the city had toyed with the idea of boycotting the sesquicentennial altogether.) In Ottawa, Prime Minister Justin Trudeau sat in the tepee with the Bawaating Water Protectors and listened to their demands that the Indian Act be scrapped and the federal department responsible for Indigenous affairs be renamed the office of honourable treaty relations. 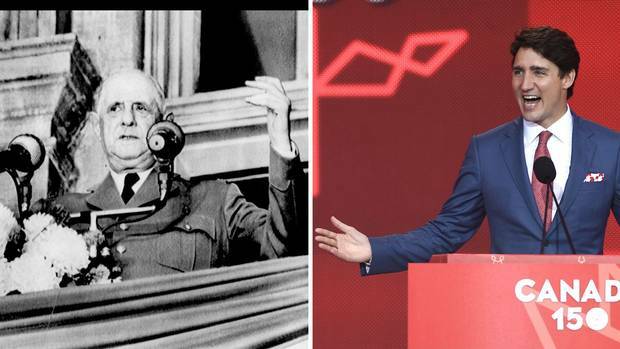 Canadians of all backgrounds debated the legacy of various historical figures whose actions, in retrospect, appear indefensible. Should the name of John A. Macdonald, Canada's first prime minister and a key figure in this country's political development, be stripped from various institutions because of his role in promoting residential schools? As a resident of Ottawa, I was particularly aware of these debates as the city ratcheted up to its big Canada Day show. Elsewhere, Canada 150 activities tended to be low-key and local – community histories and cookbooks, town parades and art shows. 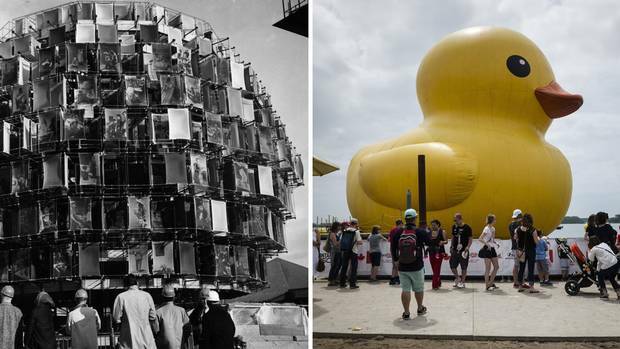 Many, such as Ontario's giant yellow rubber duck, carried no national significance at all. Others, such as the free pass to our national-parks system, achieved the laudable aim of encouraging people to enjoy themselves (and required Lake Louise facilities to order 25,000 additional industrial-sized toilet-paper rolls). 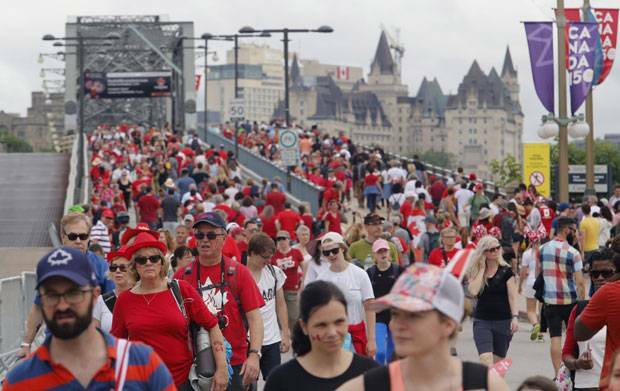 But ever since I came to live in Ottawa in 1979, Canada Day has been a big deal in the national capital. For decades, prime ministers have found the July 1 celebrations a great platform for political messaging. 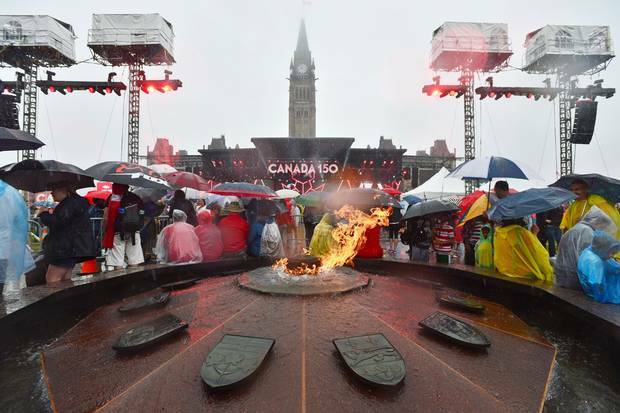 As historian Matthew Hayday of the University of Guelph has pointed out, the festivities have consistently reflected the national identity that successive federal governments were promoting. The artfully curated self-image – Brand Canada – has evolved from salutes to the country's links with Britain in the first half of the past century, through demonstrations of national unity in the second half, to this year's get-together of talented individuals from diverse communities, bonded by the land in which they live and the values they share. The sesquicentennial megashow enshrined the current government's priorities for Canada 150. When Ottawa announced the themes that would qualify projects for sesquicentennial funding, it listed a set of values: "diversity and inclusion, reconciliation with Indigenous peoples, youth and the environment." This matched the rhetoric of Prime Minister Trudeau, who identified Canada as "the first postnational state" to The New York Times soon after his election. His declaration in the interview that Canada had "no core identity, no mainstream" allowed no room for discussions of how this country developed from a collection of timid British colonies into one of the most stable and prosperous countries in the world. 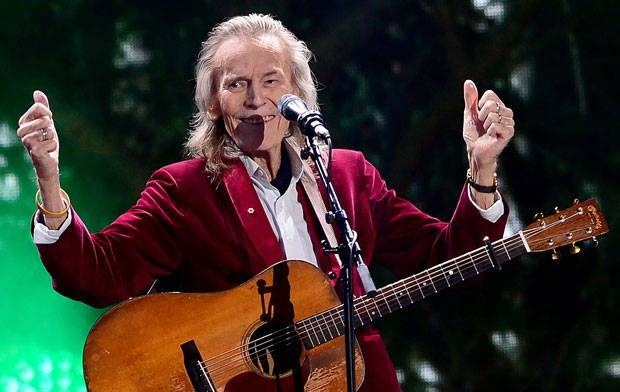 The 2017 themes were enacted with ferocity in this year's Canada Day show on the Hill, which included Gordon Lightfoot, Alessia Cara, Dean Brody, Serena Ryder, Buffy Saint-Marie, Cirque du Soleil and Walk Off the Earth – as well as the Snowbirds and our two newest astronauts. The evening's pyrotechnic display included fireworks with names such as Crazy Canuck, All Dressed and Double-Double. Diversity, Indigenous culture, youth, inclusion – plus athleticism, scientific achievement and folkloric cuisine. The Instagram-obsessed Trudeau team reckoned that these were the themes to attract 21st-century Canadians. This was the rootless present. There was no hint that we were observing our country's 150th birthday; the past was invisible, because our history has become so disputed and painful. The presence of the heir to the British throne, the Prince of Wales, was almost irrelevant. The Birthday Bash would have been a splendid national selfie had not Guantanamo-level security left thousands of would-be celebrants fuming in pouring rain, unable to get near the action. There is one institution in the national capital that has grappled with the challenge of exploring our contested histories. 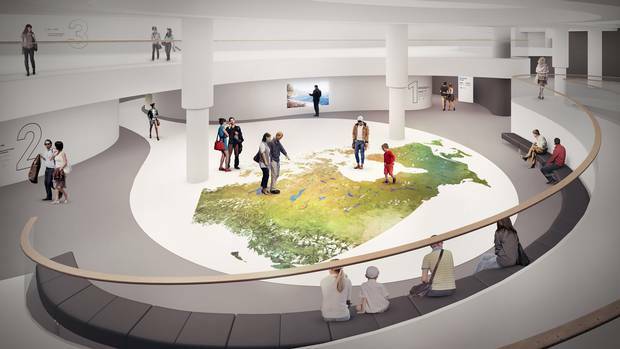 This year's Canada Day also saw the opening of the new 4,000-square-metre History Hall at the Canadian Museum of History in Gatineau, directly across the Ottawa River from Parliament Hill. The redesign, begun in 2012, took account of all the new history scholarship that the University of Ottawa's Prof. Gaffield argues was necessary for an authentic sense of Canadian identity. At the $30-million History Hall, the Canadian Museum of History found a venue to present the nation’s past in a new way. Read Daniel Leblanc’s profile of the hall’s design and the vision behind it. The main message of the new hall encompasses the complexity of our past. 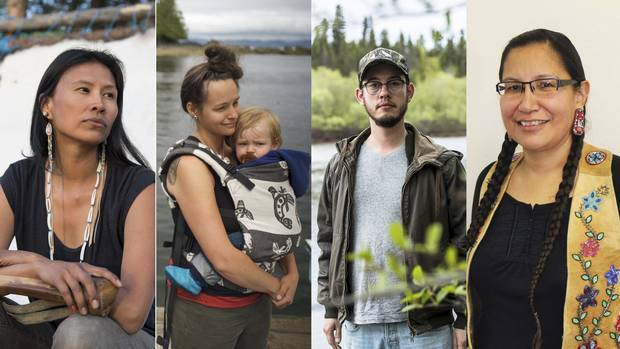 "This is the story of Canada, the stories of our country, what it is, and how it got that way. It's a story of conflict, struggle and loss; success, accomplishment and hope. It's all around us, and about us, and we shape its future." The hall tells its story of Canada largely through artifacts. That story starts 13,000 years ago, so that visitors quickly grasp that this country did not begin in 1867. When visitors finally reach Confederation, about halfway through the hall, that political deal is shown as simply one thread in our history amidst several others that are given equal weight, including Indigenous involvement in settler wars and an expanding fur trade. Searing displays about racism, residential schools, discrimination and homophobia are featured in the hall's treatment of the Canada of the late 20th century. Quebec's sovereignty movement is dealt with at length. 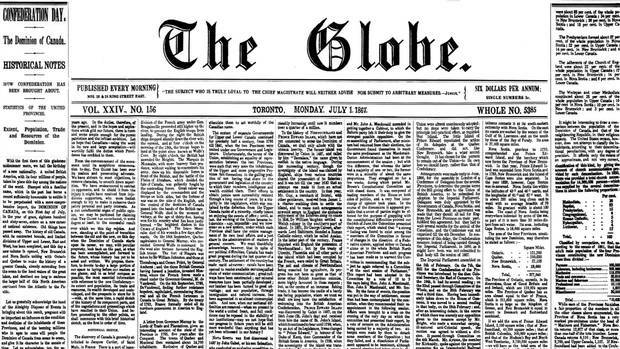 The role of John A. Macdonald in the country's checkered development is celebrated in the Confederation section, and censured in the residential-school section. Visitors leave with the idea that Canada is still a work in progress; the challenge of negotiating differences remains a constant in our public and private lives. This is not a particularly upbeat message, but it is a realistic snapshot of Canada today. In the words of Prof. Gaffield, "We now have a more evidence-based understanding of who we are and where we've come from." For that reason, Prof. Gaffield considers that the sesquicentennial has reflected a more mature country that has learned from its past, and been able to develop a Canadian voice. "It is a useful point of departure for the next 50 years." 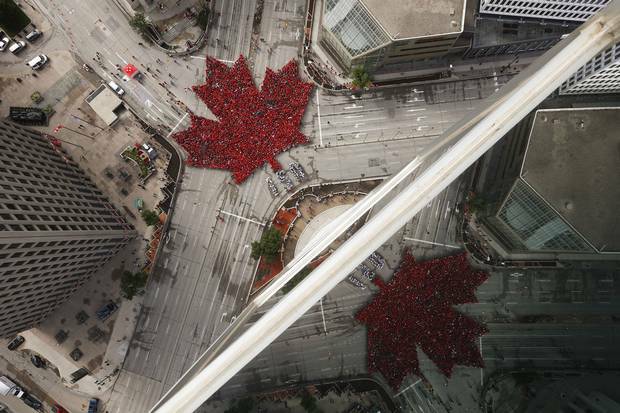 July 1, 2017: Winipeggers assemble into a ‘living leaf’ at Portage and Main. My personal takeaway from the sesquicentennial year is that anniversaries can be the enemy of good history. They may make commercial and political sense (the federal department of heritage keeps a list of upcoming occasions for such circuses). But, in an era when shattered narratives, postcolonialism and microhistories proliferate, they are minefields. The traditional role of historians at such commemorations is usually to dig below the fireworks with a few "Yes, but …"s. Yes, it is great to celebrate the anniversary of Martin Luther challenging the Roman Catholic establishment in a devastating critique of papal corruption back in 1517, but he probably didn't actually nail his 95 theses to the chapel door in Wittenberg. Yes, it is moving to observe the centenary of the Battle of Vimy Ridge in 1917, but Vimy was not the most important military engagement that Canadians fought during the First World War, and the idea that it was the carnage at Vimy that constituted the birth of modern Canada is straight mythology. This is the multiperspective approach taken by the new History Hall. But who wants to listen to historians when history is now perceived not as an intellectual process of inquiry but as a warehouse of ammunition in the battle to dominate the narrative? As I toured the country throughout 2017, talking about my book The Promise of Canada, I was acutely aware that most readers are looking for "usable" history. Different groups were looking for their pieces in the national jigsaw. Older audiences wanted reassurance that the Canada of their youth still exists underneath the demographic churn. Younger audiences wanted moral certainty that today is superior to yesterday. Indigenous peoples were not alone in trying to reframe the whole story to highlight their own experience. Countries where history has always been contested, and where violence lurks closer to the surface than it does here, are wary of anniversary celebrations. That's why Vladimir Putin carefully avoided any large commemoration of the centenary of the 1917 Russian Revolution, and why we are unlikely to see much attention paid in 2021 to the sesquicentennial of the founding of the German Empire, in which Otto von Bismarck – the Prussian John A. – united the scattered states and principalities of Germany. Will Canadians throw themselves into the bicentenary of Confederation in 2067? I'm not sure. But 2017 has not been the year of coast-to-coast euphoria that many people had expected. For that, we'll have to wait for the next big hockey win. 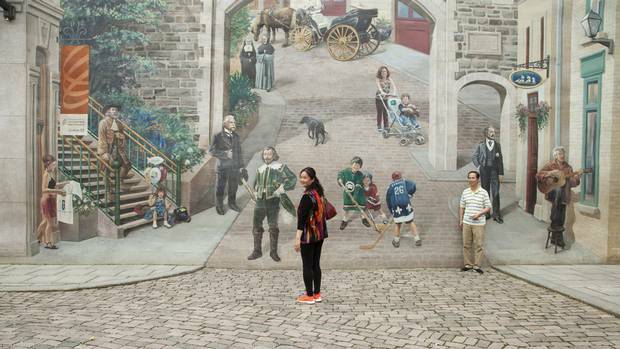 Canada 150 in 4,638 kilometres: Join tourists on a trek from Toronto to PEI and back The Globe's Ian Brown and photographer Nam Phi Dang chronicled a seven-day journey to Eastern Canada, to see what the group of mostly Chinese tourists could reveal about the country.